After many long months of intense R&D efforts in the laboratory, I am ready to make this historical, groundbreaking announcement: I have discovered, documented and validated a combination of five natural substances which can capture and remove radioactive cesium-137 from the digestive tract. This operates in much the same way that dietary fiber can capture and remove many other substances during digestion, except that the formula I have discovered has selective ionic affinity for cesium atoms. The five ingredients in this formula are all GRAS (Generally Recognized As Safe) by the FDA, and this formula can be manufactured as a dietary supplement. It is NOT a drug and no claims are being made for this formula to treat, prevent or cure any disease. The mechanism by which this formula works to capture and remove cesium-137 from the gastrointestinal tract has already been validated by the CDC and FDA for the substance called "Prussian Blue," an FDA-approved prescription drug that was urgently approved by the FDA out of fear of a radiological attack after the deadly attacks which were staged on September 11, 2001. Prussian blue traps radioactive cesium and thallium in the intestines and keeps them from being re-absorbed by the body. The radioactive materials then move through the intestines and are passed (excreted) in bowel movements. Because Prussian blue reduces the time that radioactive cesium and thallium stay in the body, it helps limit the amount of time the body is exposed to radiation. The FDA explains, on the same web page that also explains "dirty bombs", that Prussian Blue "can be used to treat contamination that may occur as a result of a routine accidental poisoning, as well as contamination associated with a terrorist event." Prussian Blue, however, is a prescription drug based on a synthetic chemical with toxic side effects. Prussian Blue is actually a pigment chemical used by painters and artists. The synthetic chemical produces a beautiful blue color in paintings, but it is not a food, nor is it GRAS by the FDA. As part of my R&D on this project, I was able to acquire a sample of Prussian Blue and test it for its ability to capture cesium-137 during digestion. My laboratory tests confirmed that Prussian Blue is highly effective for this purpose, further validating the fact that my own M.C.C. laboratory methodology is in alignment with the laboratory methodologies used by the FDA to evaluate the metals capturing capacity of candidate substances. In fact, earlier this week when I released laboratory data on the breakthrough finding of the heavy metal tungsten in rice protein products, nobody was able to refute the data. Ultimately, my findings were privately confirmed by several industry insiders who admitted to me that yes, there is tungsten in rice protein and the labs have confirmed it. This formula for capturing cesium-137 and removing it from the digestive tract has the physical and chemical property of capturing cesium atoms. Accordingly, it can capturing cesium atoms from any originating cause, including nuclear accidents, nuclear bombs or dirty bombs / terrorists events. This formula will be manufactured and made available as a very affordable dietary supplement manufactured in the USA and using no ingredients from China. It will be sold online beginning in April of this year. We will begin taking pre-orders sometime in March, and even though we expect many national governments to place large contract orders for this breakthrough radiological defense supplement, we are committed to reserving at least 25% of our production for individual customers. This formula, whose name has not yet been announced, will be the world's first and only laboratory-validated radiological defense supplement. Every other so-called "anti-radiation" supplement either already on the market or soon to be introduced is merely an educated guess when it comes to actual efficacy. In contrast to that, the radiological defense supplement I have developed will be released along with very specific, replicable, scientifically-validated laboratory data that describes exactly how many micrograms of cesium-137 can be "captured" by each gram of this formula. Even better, my scientific data consists of M.C.C. numbers (Metals Capturing Capacity) along a large concentration curve for cesium-137. All the data will be easily replicable by any competent university or government laboratory with sufficiently intelligent scientists who are capable of understanding the testing methodologies. As Natural News readers well know, I am the inventor of the Metals Capturing Capacity laboratory methodology and testing protocols, as described in this M.C.C. video. I explain the principles of atomic spectroscopy and how I conduct sample testing in this technical explanation video. Using these methodologies, I acquired and tested over 1,000 candidate botanicals and dietary substances for their ability to bind with cesium, uranium and strontium atoms. Unlike the FDA, I did not test for thallium affinity. Nearly all candidate substances failed miserably on cesium. Quite a few substances did very well with uranium, however, including our Clean Chlorella product, which is the cleanest commercially-produced chlorella on planet Earth in terms of ultra-low heavy metals. In fact, both Hawaiian Spirulina and Clean Chlorella had very impressive efficacy for uranium capturing capacity, but neither one was strong for cesium. The answer to this challenge was never found in a single substance. Ultimately, the solution came from combining five different substances in every specific ratios which were entirely counter-intuitive. Through thousands of ICP-MS tests on different combinations and ratios of different substances, I was slowly able to document and replicate the ionic affinity behavior of various substance combinations. This was a costly, painstaking process, and it has taken tremendous resources of time, money and effort. The result, however, can help save millions of lives from present and future radiological accidents. This formula currently blocks up to 95% of cesium-137 during digestion, depending on the actual concentration of cesium in the gastrointestinal tract. With some planned tweaks, I may be able to increase that 95% even more. Obviously, there will be naysayers, pessimists and skeptics who will sadly attempt to claim this announcement is a hoax, but remember that these people have never run a single atomic spectroscopy test themselves, they have no knowledge of how an ICP-MS lab really runs, they usually have no high-level scientific training whatsoever and they only exist to try to harm other people and disrupt the sharing of important solutions for humanity. To further prove the efficacy of this formula, upon release of this dietary supplement, I will offer a $1 million reward to anyone who can prove in a laboratory that the supplement does NOT bind with cesium-137. This reward will, of course, go entirely unclaimed forever, for the simple reason that every single gram of this substance has very high ionic affinity for cesium-137, and the laws of physics cannot be changed merely by wishing them so. In fact, if someone could take this substance and, using only their mind, make it not bind with cesium-137, then they wouldn't need $1 million because they could obviously just transmute lead into gold! However, I highly doubt any person in the history of humanity could transmute metals with their mental powers. And you can be sure that if such a person actually existed, they wouldn't be posting comments on Facebook or sending tweets. If you would like to receive the very first announcement of availability of this formula, simply join our email list (below), and you will receive an announcement BEFORE we post it on the web. Our plan is to launch this formula with an affiliate program structure so that selected partners can help promote it and be compensated for their efforts. If you are interested in becoming an affiliate partner to help promote this product to those who can benefit from it, please also join our email list because that's where we will announce the affiliate program first. Keep in mind that this dietary supplement is NOT a "daily vitamin pill" or routine supplement. It is only for specific use in emergency situations where risk of dietary exposure to cesium-137 is high. We do not recommend daily intake of this supplement. Most people who purchase this supplement will likely put it on the shelf and save it for a radiological or nuclear catastrophe or possible nuclear war scenario. In that scenario, the value of these supplements will be truly priceless, and I imagine that our manufacturing facility would be almost immediately taken over by FEMA, at gunpoint as it described in painful detail in Obama's executive orders that appear to already anticipate World War III. For this reason, I am going to personally attempt to manufacture and stockpile as much of this product as I can manage throughout 2014. But in the case of a nuclear catastrophe, nuclear war or sudden worsening of the Fukushima situation, our supplies will be wiped out within days, even with stockpiling in advance. Remember what happened with iodine sales in March, 2011, right after Fukushima? You couldn't get iodine for months, and people tried to sell $10 iodine packets on eBay for $600! If you are reading this and want some of this for yourself, my advice is to get on our email list and watch it every day between now and early April for our announcement. We are expecting commercial runs to be available in April. How do I become a reseller or affiliate? Join our email list (below) and we will announce details there first. Why can't I just take iodine instead? Iodine only protects ONE organ in your body from radiation poisoning: your thyroid. Some marketers of iodine supplements wildly exaggerate their claims and imply that iodine offers some sort of "magic bullet" defense against all radiation. That is utterly false. Iodine offers ZERO protection against radioactive food. It is made of five key ingredients. Four are things you will immediately recognize. The fifth ingredient is derived from a rare marine botanical which almost no one will recognize. All five ingredients are already considered safe for consumption by the FDA. Does the product block radiation damage to my thyroid? No, you will need iodine to protect your thyroid. Does the product make me immune to radiation? Of course not. If you inhale radioactive particles, you will still be poisoned with radiation in your lungs. This supplement is not magic. It does not turn you into a superhero. It only captures cesium-137 in your digestive tract (i.e. found in the food you eat or the water you drink). We anticipate a retail price of around $25 per bottle, with actual street prices around $20 per bottle. Each bottle will likely contain 100 capsules, manufacturing in a GMP-compliant facility that meets or exceeds FDA regulatory requirements. How is this product being tested in the lab? The product was formulated using ICP-MS testing. The efficacy of it is tested using a digestion simulator and synthetic gastric acid which mimics human digestion. The actual process is somewhat complex and will be covered in more detail in a future science paper. Has the efficacy been validated by other labs? In short, yes, it will be. (I removed my previously wordy answer to this question...) What's especially fascinating about this question is that my own lab is the authority on Metals Capturing Capacity methodologies, so I actually have to teach other labs how to properly conduct this testing in order for them to validate the results. Why did you develop this product? Because I would very much like to survive the coming radiological catastrophes which will increasingly threaten human life on our planet. Once I figured out the solution, it was a natural desire to commercialize the product and help others protect their lives, too. 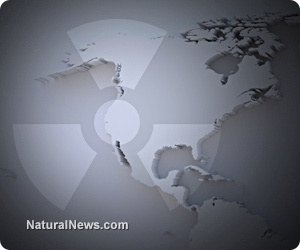 Does this supplement remove radioactive cesium from my body's organs and tissues? No. It only functions in the gastrointestinal tract. To my knowledge, there is no such thing as a supplement which can remove radioactive cesium from your body's organs and tissues. Anyone who claims such a thing should be immediately suspected of being a fraud unless they can prove with scientific data that such amazing feats are possible with their product.